You can use all sorts of vegetables for this dish, it could depend on what you have around and in season. Makes sure they are all bite sized and that there is a balance of colours which is always pleasing to the appetite. Soak the noodles in lukewarm water for half hour then drain and dry in a sieve. 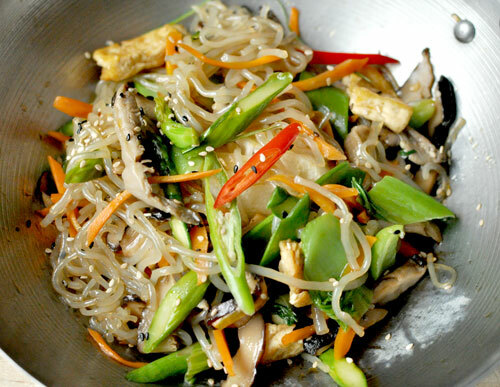 In a wok, cook the noodles with a splash of water and light soy and a pinch of sugar on low heat. Place a lid over to steam the noodles, stirring occasionally. Remove and place on plate. Prepare all the vegetables and tofu and fry together in a wok with garlic. Season with light soy sauce and a splash of water, then add the noodles and stir fry everything with oyster sauce. Serve with sesame seeds and fresh coriander or spring onions.